Download our latest Media Kit! 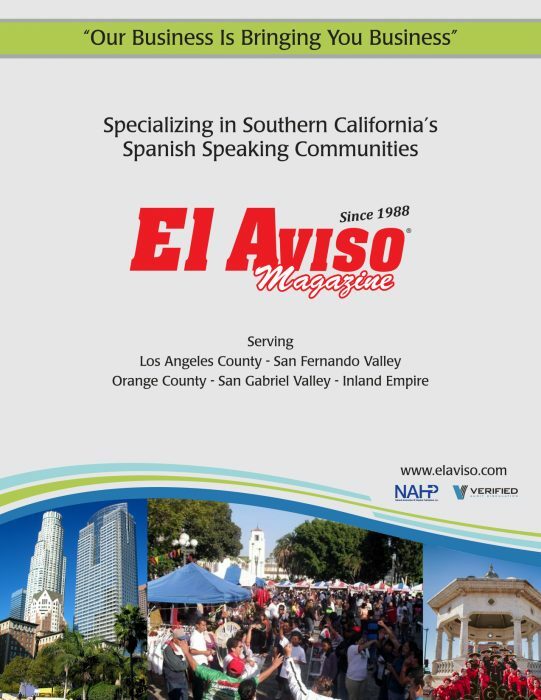 El Aviso Magazine is an award winning Spanish language weekly publication with an average issue audience more than 601k; it’s a one of a kind way to reach highly responsive Spanish Speaking market. El Aviso was established in 1988, and it is distributed throughout the Los Angeles Demographic Area in areas of high Hispanic populations. El Aviso Magazine offers a unique blend of Social & Political, Health & Welfare, General Cultural, Motivational, Family, Entertainment and Personal Article content and even a dash of the Unbelievable-.